This week's quiz was extremely tough and not many answers were submitted because of that. Only three people got the answer right this week! I think we can safely start by saying that everyone was able to figure out that this was some species of bird of prey and more specifically a hawk. From there, it gets much trickier. One of the first steps is to determine that age of this bird. From the streaking on the chest, we can see that it is transitioning from juvenile to adult plumage. The best feature to look at on this bird is the shape and color of the barring on the chest. 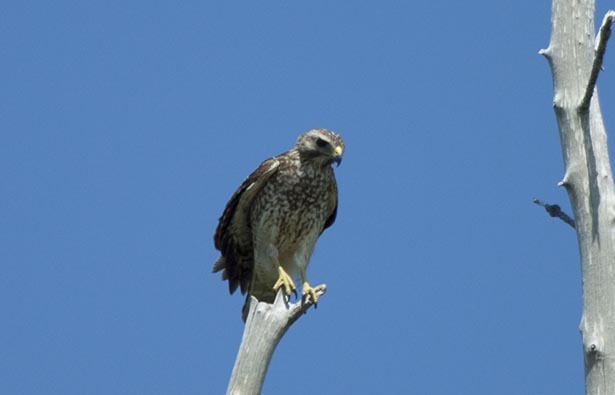 The brownish color and spacing of the barring lead us to identify this as a Broad-winged Hawk rather than a Red-shouldered Hawk that would be more red in color and show denser barring. The next and final quiz in our March quiz series can be found here http://nuttybirder.com/BirdQuiz/birdquiz.html#.UU-38xx-qSo.